Ice play is an exciting (and super easy which is exciting for you) toddler activity that stimulates their senses. 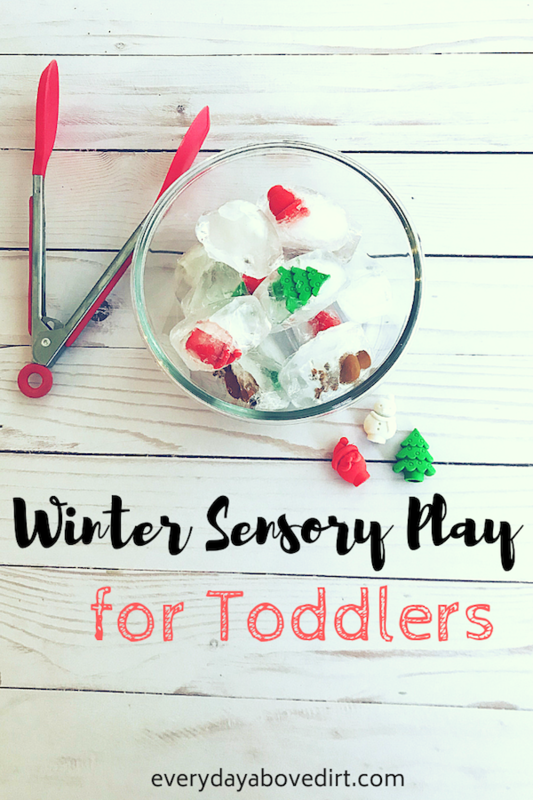 Providing toddlers and young children with ways to have sensory play is an important part of their learning. I go a little deeper into the background of sensory play in my post about Toddler Sensory Play: Flour Edition. 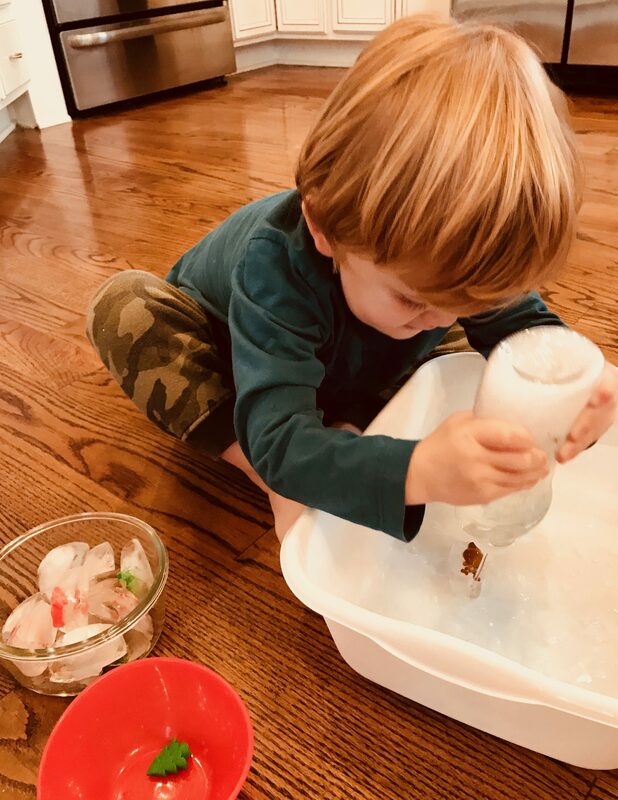 When thinking about our next sensory activity, ice play felt pretty natural. 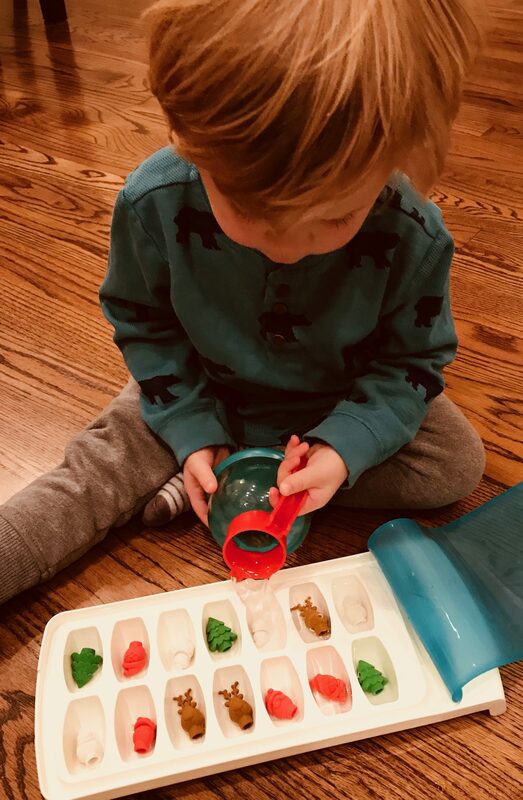 After all, the holiday season is quickly rolling around and ice play seemed like the perfect way to get in the Christmas spirit! 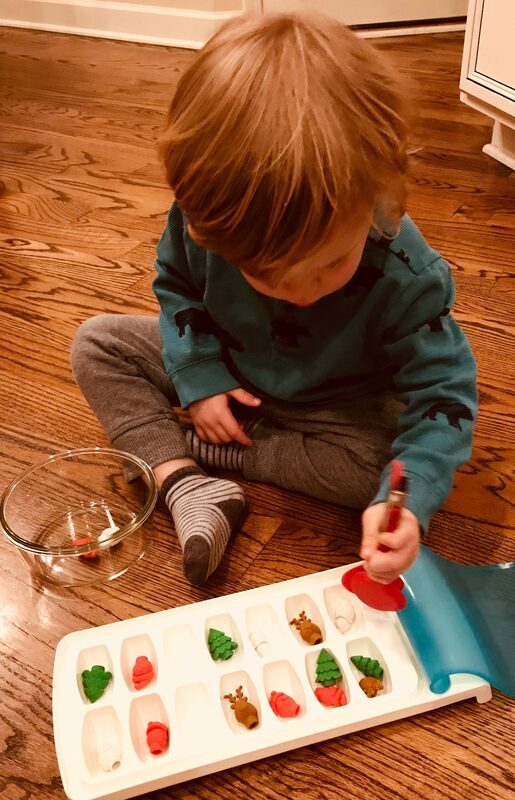 We’ve frozen cars in ice and put food coloring in ice but adding our little holiday friends was a new level of excitement! The new level of excitement for me was finding all of my materials at the Dollar Store! For the sake of convenience I’ll also include links to the materials (affiliate links at no cost to you). Items at Dollar Stores tend to vary, but I’m sure you’ll be able to find something similar to the ones we used. In order to extend our activity I had my son help me assemble our ice play from step one! The first thing I asked him to do was to put the Holiday Erasers in the Ice Cube Trey one at a time using his tongs. The one at a time thing didn’t always happen. You’ll see that there are a couple with two in them. But, we talked about the difference between one and two and I asked him to put one in another cube slot. I try to use every opportunity as a learning opportunity (but there are many times that fails). This alone was a great toddler activity. He was using his fine motor skills to pick up each eraser and then precision to place it in the correct slot. After our Holiday Erasers were disbursed we moved onto Step 2. I feel like whenever you put your toddler in charge of the water, they’ve had a good day! This level of responsibility always thrills him and makes me a bit nervous. I don’t know why, after all it’s just water. But this particular time turned out really well. I explained to him that in order for us to freeze our holiday friends we needed to add water to our trey. I instructed him to fill each cube up to the top and to be VERY CAREFUL! He did spill some. I feel like that’s to be expected. 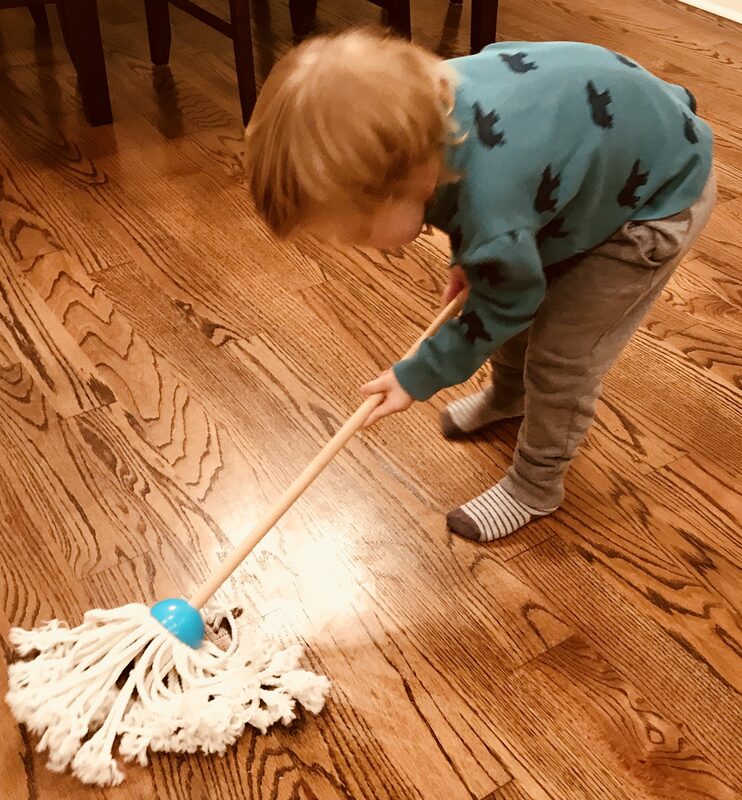 But, he quickly rushed to get this mop so he could clean it up. Bless his sweet little heart. Side note: this little cleaning set from Melissa & Doug has been one of the most used toys we got him last Christmas. I’m leaving the link but they also sale them at Target. He was really committed to drying the floor. So stinking cute! After everything was cleaned up. We put the ice cube trey in the freezer and I told him that it needed to freeze over night but we would visit our holiday friends in the morning! Step 3 was definitely the best part of this activity. I gave him a squirter. You can use an emptied out small Dawn Dish Soap bottle from the Dollar Store. Put warm water in the bottle because it’ll help the ice melt faster. I called it the “magic potion” just to up the fun factor. Then I told him to use his tongs to place one ice cube in the bin one at a time. I told him that he needed to use his magical potion to set his holiday friends free. Using a squirt bottle is a great skill for toddlers because they have to squeeze the bottle while aiming at the ice. Hello hand, eye coordination. After the holiday friends were free I told him to use his tongs once again to place the thawed objects into the red bowl pictured above. You can use whatever bowls you want for the ice and the thawed objects. He continued this until all of them were free!! After a while I left the water in the bin and that helped thaw the ice quicker. So, if you want it to last longer be sure to empty the excess water out between ice cubes. Once again I extended our ice play by adding in a sorting section at the very end. After all of our holiday friends were thawed. 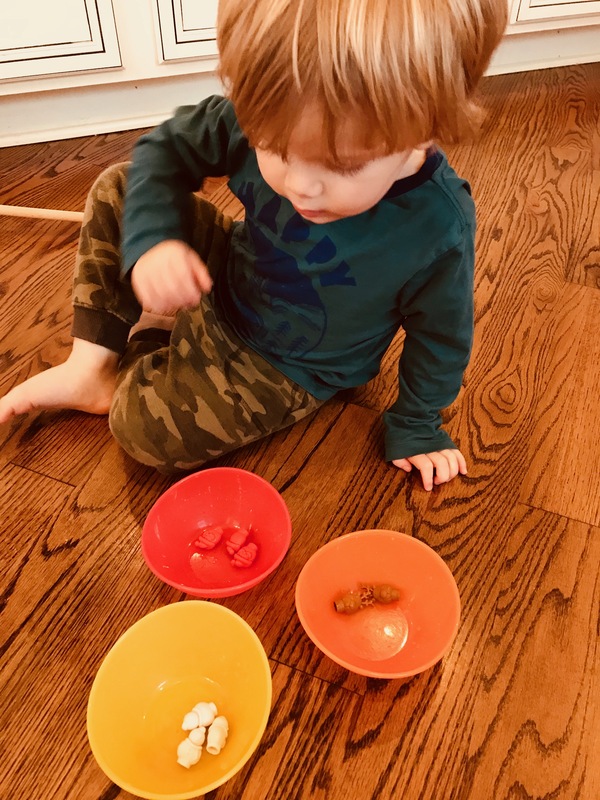 I told my son he was now going to sort all of them into different bowls. We talked about how you put the ones that look alike together. I demonstrated once and then he quickly caught on. When I was an elementary school teacher this was a skill that we worked on in First Grade. So, it doesn’t hurt to give our little toddlers a little head start. Ice play was a huge success! I hope that you and your child have a ton of fun with this icey activity. 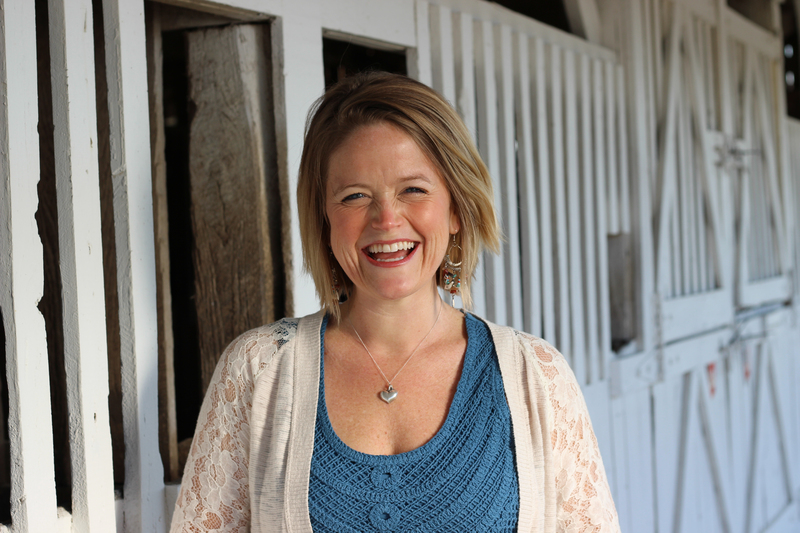 I’ll definitely be adding this to my quick and easy toddler activities list! p.s. If your child is into The Incredibles you should definitely check out this Frozen Ice Challenge by The Salty Mamas! This caught my eye since I have those exact erasers from the Dollar Store! We were using them in a rice sensory bin, but I am definitely going to try this out! Haha, that’s awesome! I love the Dollar Store. The cutest stuff for $1?! Yes please! I hope you guys have fun!